It’s such lovely and warm day I can’t imagine I’m sitting indoors trying to finish this post. One of my new years’ resolutions was to keep to the schedule so I’ve no choice but o get it done right now. I’ve been making this recipe for a long time, but every time I want it, am always searching for the book where I scribbled the list of ingredients. It’s so much better to have recipes online because you can access them from any corner of the world. Please always remember to assemble all ingredients before you start. Preheat oven to 400°F (200°C). Cook macaroni in plenty of salted water as per packet instructions until just tender but with a bit of a crunch. Drain and toss with 1 tablespoon olive oil. 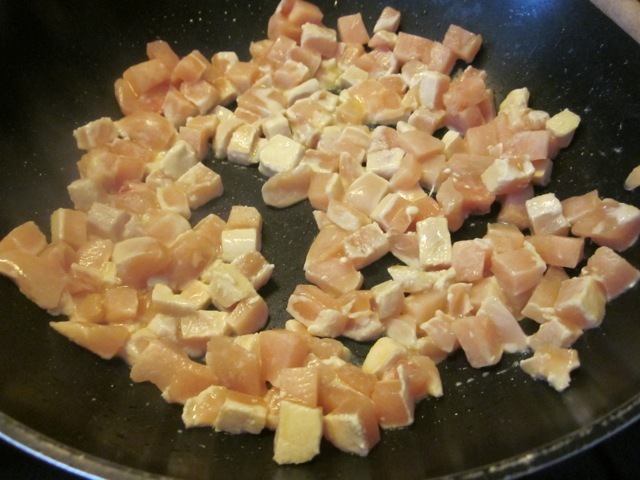 Heat 1 tablespoon oil in a heavy based pan or wok and fry chicken quickly over high heat until browned and no longer pink. Drain chicken on paper towel. 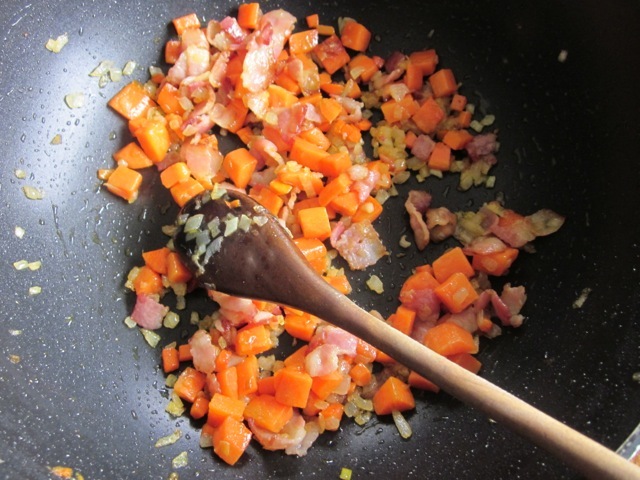 and then add the onion and carrot and cook gently on medium low heat for 10 minutes. and the soup and water, and simmer uncovered, 5 minutes.. Remove from heat. 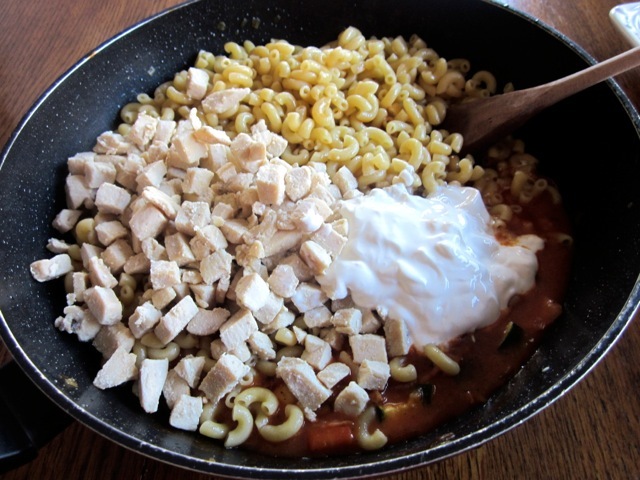 Toss in the pasta, chicken and sour cream into the tomato mixture and season to taste. 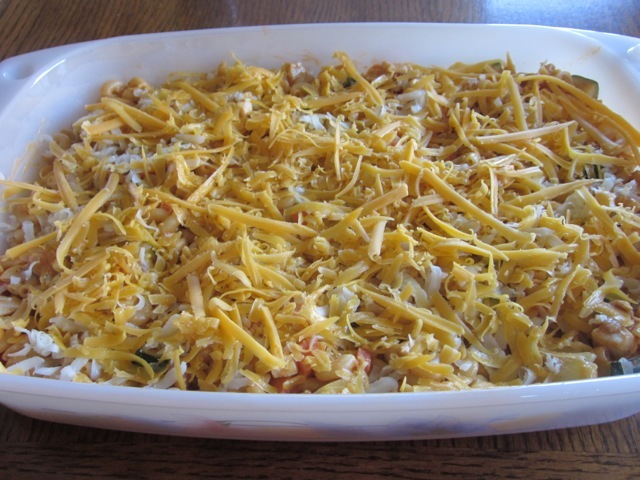 Spread the pasta mixture into a shallow ovenproof dish ((I used a 13 x 9 inch) and top with the cheese. Bake 20 minutes or until golden and cooked through. It was delicious. We make this once a week. You can vary the vegetables, the soup or the meat you add to suit you. Preheat oven to 400°F (200°C). Cook macaroni in plenty of salted water as per packet instructions until just tender but with a bit of a crunch. Drain and toss with 1 tablespoon olive oil. 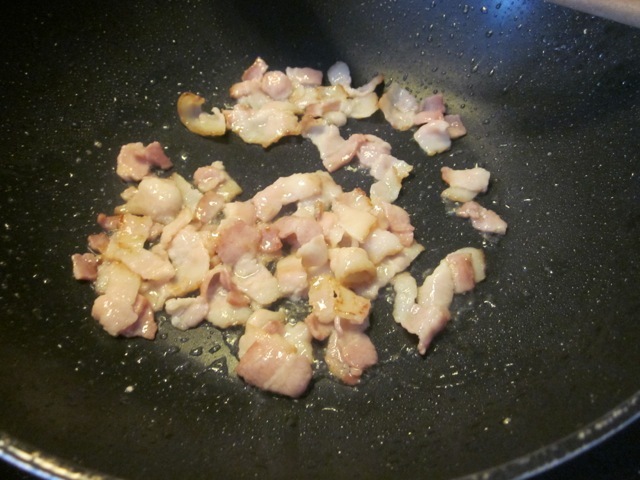 In the same pan, cook the bacon until browned, and then add the onion and carrot and cook gently on medium low heat for 10 minutes. 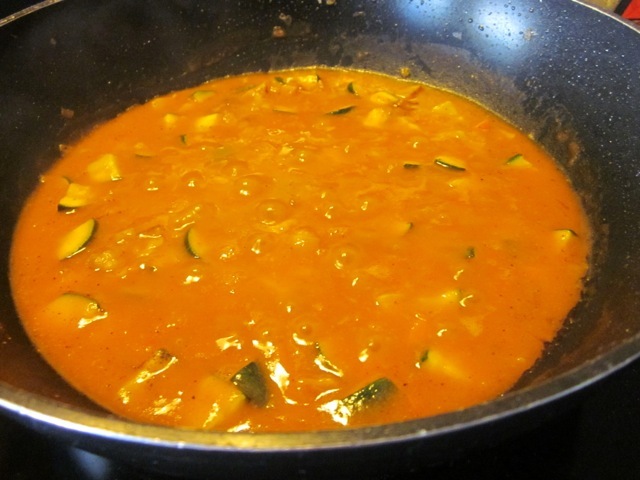 Add Zucchini, soup and water and simmer uncovered, 5 minutes. Remove from heat. 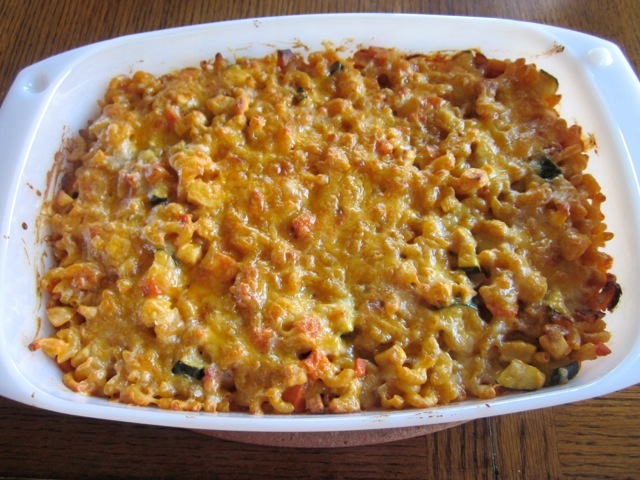 Toss in the pasta, chicken and sour cream into the tomato mixture and season to taste. 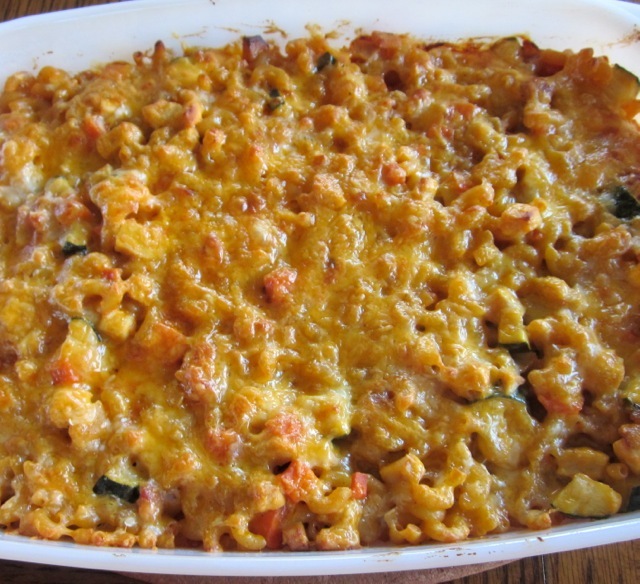 Spread the pasta mixture into a 13 x 9 (33 x 23cm) inch ovenproof dish and top with the cheese. Bake 20 minutes or until golden and cooked through. Serve. It’s 9 o clock in the morning here and I could spoon into that right now! Looks so homely and tasty. I love classic dishes with a twist! Ha ha macaroni in the morning? not a bad idea. I have some left overs here. Maybe I could drop them into the virtual chute? Have a lovely day! Mmmmm yes please! 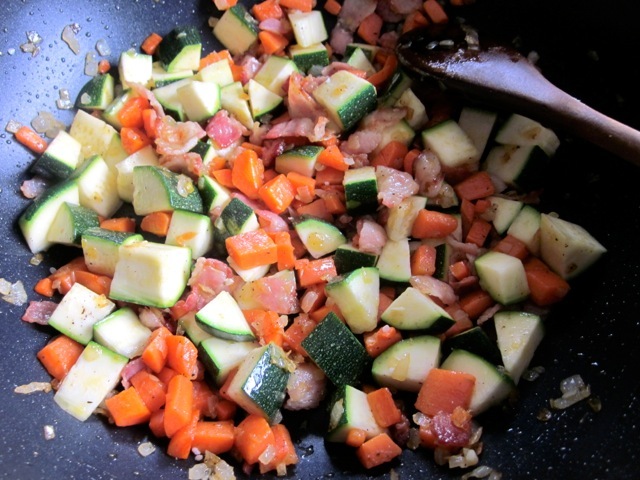 It’s time for making dinner here…got a roast chicken in the oven! Omg I want some roast chicken….please! 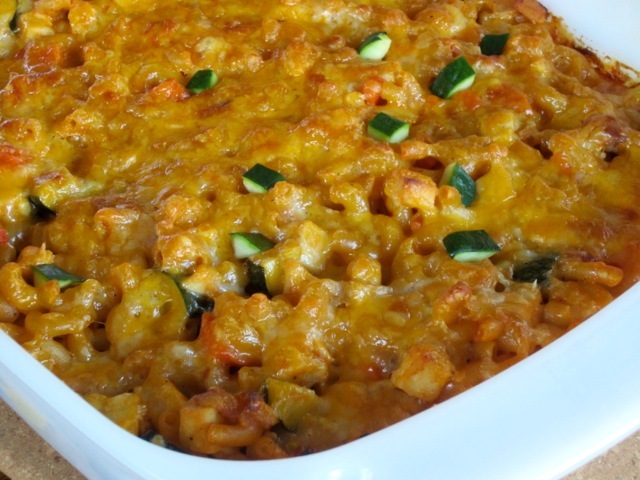 What a great recipe for sneaking in vegetables! Ha ha. Fortunately my kinds love veggies! this looks delicious! i love pasta!!!! 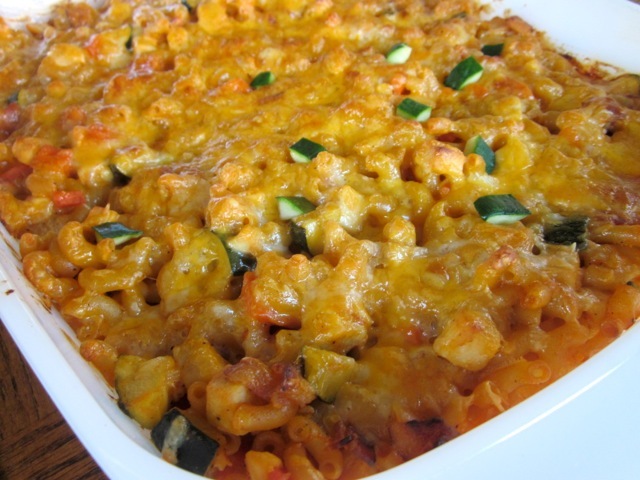 Another versatile pasta dish–it’s as if you know me! 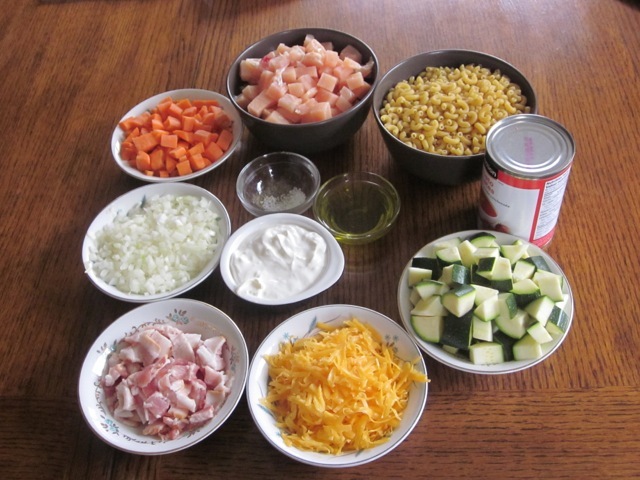 If you do find a recipe for macaroni and white fish, a good one, do share it… I have only gone as far as macaroni and csnned tuna. Have a lovely sunday ! Oh I’ve done macaroni and canned tuna too. Have a great Sunday! I love macaroni and ground pork too. I used to make it every week some years ago. I think I should make some this week! Thanks and enjoy the week! This looks delicious, definitely would be popular in our house! Enjoy your warm weather and weekend. We were in the 90s yesterday and roasts toasty hot! I really enjoyed. I’ve just come back home (10pm) and now watching news before I retire to bed. Have a lovely Sunday and best wishes! Well, that caught me by surprise, I immediately thought Mac and cheese…LOL! Well, why not Mac and chicken? What a great idea, and it looks totally delicious. (I think I’m getting hungry) it started out to be a nice sunny day but some clouds rolled in and I still refuse to wear long pants. Shorts R me! How are things in your part of the country? PS….saved recipe in iPad! Thank you. 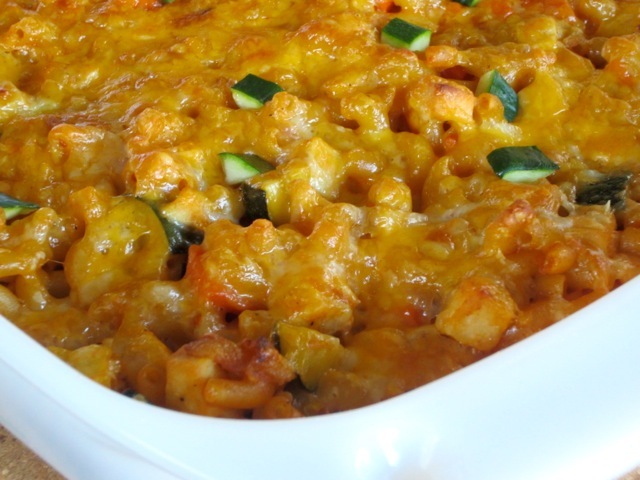 Ha ha Everybody thinks “Mac and Cheese” but this has cheese too but is more versatile. I’ve just made it for dinner and added celery because I have this huge bunch of celery that has to be used every time I am cooking…otherwise it will end up in a bin somewhere! Today I used Canadian peameal bacon. It’s less fatty but I still added lots of sour cream (LOL). I wore a capri pant so neither here nor there but it’s still nice and sunny and warm here. My windows, doors etc are open What a lovely feeling with fresh air breezing in and birds tweeting in the background and children’s laugher in the air. Omg it feels like heaven…I have added weight so I’m refraining from shorts. Thanks for saving and being such a lovely friend. I wish you the best of the weekend. Best wishes! Sounds lovely liz, love the dish today…. And by the way I bought lots of fresh fruits and have been gobbling instead of sweets. Best wishes!